Over the past while I have witnessed several individuals and companies being dressed down by leading members of Irelandâ€™s online community. These are individuals and companies that have broken the rules of the community. The misdemeanour could range from the way they set up their blog, taking advertising on their personal website, to sending unsolicited emails to large numbers of people. Individuals are named and shamed, and often rightly so. I’ve given out when people set their blog up on blogspot, which I call catpissspot. I’ve given out when people dress lies up as advertising and I’m constantly giving out about businesses spamming people. It’s frequently pointed out to me that I’m very ratty on this blog. Certainly when it comes to spamming, I wouldn’t shed a single tear when a business infringes on my privacy and blames it on a simple mistake and then gets hammered. If we had a competent Data Privacy Commissioner I think this would happen less. It’s like the excuse those headcases give when they microwave their dogs. They didn’t know. They were never informed. That was never written down. No get out of jail card there from me. Anyway, back to the point. I’ve previously mentioned the art of being subtle and of observing and I left a comment advocating the same on Brendan’s blog post. The trouble is that it seems companies now hire consultants to quickly tell them what the rules and nuances of this online game are and the companies jump straight in with their rulebook learned off by heart. They still need to observe. What’s with the rush? What do you think? Should we attempt to turn the other cheek and not get so enraged? Leave a comment over there. Brendan is the chair of the IIA Social Media Working Group and I’m sure would enjoy as much constructive feedback and different viewpoints as possible. Image nicked from Robin, taken by Donncha. Go TechLudd in the People’s Republic. I hope we see many more. Disappointing that there wasn’t a large turnout but it is holiday season. Well done to Anton for organising this. And thanks. It was great to get to see people from Dublin, Limerick, Cork and elsewhere. Also nice to see people I hadn’t seen in hours, days, weeks and years! In the room were three, count em! THREE stars of Techcrunch.com. Can you guess who they were? Robin is destined to be a fourth for definite. SnapScribe should be able to get there too. Great idea and great tech. We need more events like TechLudd with the demos, drinks and networking. Got some good feedback from people who hadn’t been to tech events in Cork before. They’ll be back and will be bringing others. Donncha gives his and has amazing photos of the 2009 home of the Blog Awards. Jaysus it looks great. Robin talks about his thoughts here. A few people told me that they got a spam email from Scott in BrandEvents.ie today. And not for the first time. What’s worse is these gobshites put all the addresses in the CC field so everyone can see who got the email. The A-C email contains 1300 emails alone it seems. So people have made a complaint to the Data Protection Commissioner who’ll no doubt give Brand Events a hug or something. Not like they will do anything more than give them a warning. Ciaran blogged about it here. He has already asked to be removed from the list and his request appears to have been ignored. They also told him that no Scott works there. So they’re using a fake persona to send emails? That seems dodgy to me. I wonder can they be done under the new EU Consumer Protection laws for fakery? Might be work informing the National Consumer Agency. I actually feel guilt when I don’t get my Fluffy links out first thing in the morning. Happy Electric Picnic Friday! 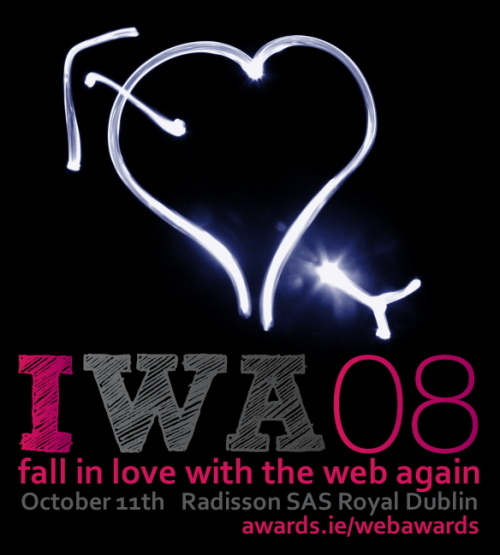 Nominations for the Irish Web Awards close in a few hours. Get last minute nominating! Nialler’s Electric Picnic Mixtape. Go get it! Rhymes With Porridge – DaithÃ­ Mac SÃ­thigh has a new blog. Via Annie Mole – Steve Guttenberg is in the Cinderella Panto this year! Mahoney! What a clever business card for a fitness instructor. Who Is MSNBC Anchor Joe Scarborough? I like it, what is it? Murphy’s Ice Cream did champagne sorbet at the Rose of Tralee. Check out the great pics. Meanwhile the Crossanator talks Rubix and Roses. Great pics of damaged and baked computer goods from Joe in PutPlace. Geeks may cry. Light from heaven. Anthony has a lovely post about the Media Training I did in Cork yesterday but his pic of the urinals in the Cork Airport Hotel shows how the lighting almost looks like rays from heaven directing you to go for a pee. The hotel is also the venue for the Digital Media Island event tonight. Come one, come all. It should be a good evening with a few tech demos and lots of networking. SoundCheck is hosting a pre-Picnic party @ Spy, South William St, on Thursday with DJ sets from Adrian Crowley, Sinead Ni Mhordha and the SoundCheck DJs. Should be great fun, and a good way to start your Picnic weekend! There’s also a tweetup too at Electric Picnic at the Pink Boat! Hugh has a great post about living on the edge. Well worth reading no matter what type of business you’re in. Beckham got his eyes done? Apparently so. Seth Godin says click on ads to say thanks. Jesus, he’s getting it less these days. Ads = not tip jars. Nice jump in Internet usage in Ireland. Hands free cigarette what? WHAT? Very late but what the heck! SoHo Solo, the West Cork business network has a new blog/website. I do blogs. No need to give them my email to get updates now. Good man Calvin! I like this from OFTR. Dell Boy. I love FFFFound. What a cool image. There’s now car pooling/hourly car rental in Cork. Senator Mark Daly now has a YouTube channel. No need for ambien for those sleepless nights now. For those that like their statporn in graph format. And then Debz points out StairPorn. Propose Live on TV with WillYouMarryMe.ie – I expect a sister site called RejectedGobshites.ie to pop up any day now. This is marketing. Clever Burger King. The Scottish are coming. Hard Working Class Heroes lineup announced. So the Sunday Times want to know about every communication between Independent News and Media since 2006 and that od the Dept. of Comms. At the same time Smart Telecom want to know about all comms between the Dept and everyone else when eircom cut them off the telecoms grid. (This resulted in all of Smart’s phone customers being left hang and had to move back to eircom or another porvider.) All this and more in August’s Dept. Of Comms FOI requests. This is my rifle. There are many like it. I dunno, it was in my head and I was looking for a picture with colour in it.